The Greenbrier section of Great Smoky Mountains National Park can be found six miles east of Gatlinburg, Tennessee on Highway 321. Also known as Big Greenbrier, this watershed is widely considered the finest example of a cove hardwood forest on planet Earth. The entrance to the cove is a narrow paved road which meanders alongside the Middle Prong of the Little Pigeon River. The first mile into Greenbrier has many riverside pull outs for fishing, paddling, and the occasional wedding ceremony. After passing the ranger station the road turns to gravel and narrows, so please be courteous and allow room for other vehicles to maneuver. Past the ranger station the next landmark will be a quiet picnic area on the left next to the river. The picnic grounds have several tables and composting toilets. Traveling on you will soon find a pair of bridges on the left. The Grapeyard Ridge trail begins on the west side of the bridges. Grapeyard Ridge meanders 7.6 miles west ending at the Cherokee Orchard Motor Nature Trail. The Old Settler’s trail begins on the east side of the bridges. Old Settlers trail stretches 15.9 miles east to its junction with Maddron Bald trail and Gabes Mountain trail. Turn left onto the bridge and drive 1.5 miles to the Ramsay Cascade trailhead. Ramsay Cascades is a tough eight mile round trip hike to one of the tallest and most beautiful waterfalls found in the Great Smoky Mountain National Park. The trail is renowned for its old growth forest and giant trees in addition to the awe inspiring waterfall. Remaining straight at the bridge will bring you to the second picnic area found in Greenbrier. This spot has a covered pavilion, picnic tables, a pure, running spring and composting toilets. Smoky Mountain Saint Patrick’s Day Events. You don’t need the luck of the Irish to find plenty of fun this Saint Patrick’s Day. These ancient mountains are steeped in Scotch-Irish history and tradition. Even the landscape brings to mind the emerald green hills of Ireland. Here are a few holiday hints that will point you toward your pot of gold on one of our favorite holidays. The Fox and Parrot Tavern in Gatlinburg offers a variety of delicious holiday craft beers in a friendly atmosphere. This tavern has long been a favorite for locals and for good reason. Their bill of fare boasts such Irish staples as corned beef and cabbage along with other menu items that includes delicious steaks and chicken dishes. Discerning diners will find something to please their palate and can wash it all down with a cold, green beer. The Facebook group Smoky Mountain Hikertrash is hosting a group hike to beautiful Ramsey Cascades. This amazing waterfall is found in the Greenbrier area of the Smokies and is one of the tallest waterfalls accessible by a maintained trail in the national park. The hike, an eight mile round trip, traverses some of the most beautiful old growth forest in the region. The hike is considered strenuous and participants should be prepared for any type weather. The hike, scheduled for 8:30 a.m. on Saturday, March 16, 2019, begins at the Ramsey Cascades trailhead and ends at approximately 4:30 p.m. Participants are encouraged to bring lunch, snacks and water as well as basic hiking essentials. 5 Great Smoky Mountain Fathers Day Ideas! There is no end to the fun on Fathers Day in the Smokies! 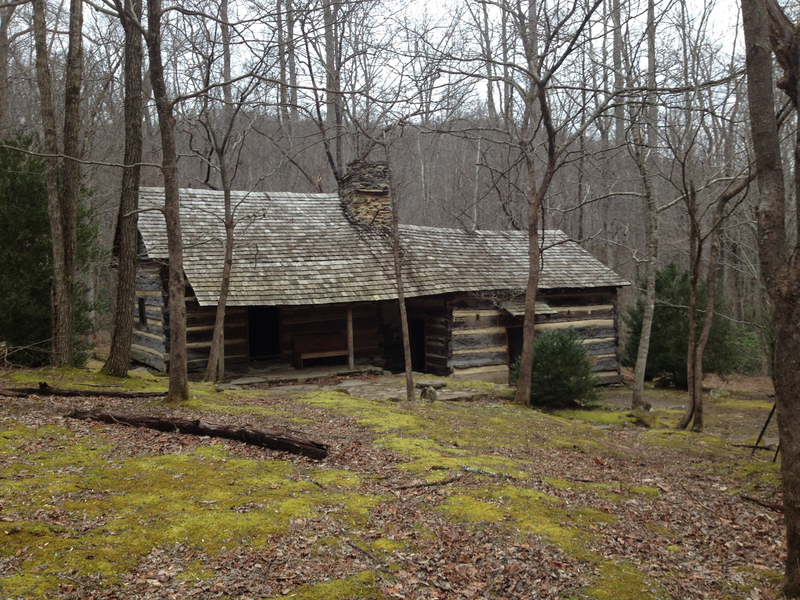 5 Great Smoky Mountain Fathers Day Ideas! 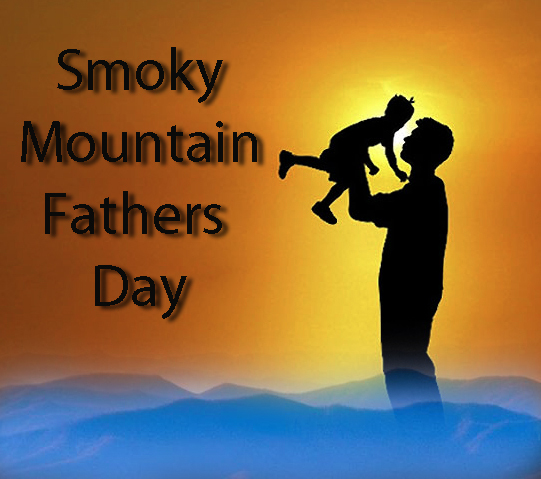 Fathers Day in The Great Smoky Mountains is right around the corner on Sunday, June 17, 2018. The Great Smoky Mountains offer so many ways to celebrate Dad’s special day. If your Dad prefers, hiking, biking, fishing, great food or a cold brewski, the forests, towns and valleys located around the park have you covered. Does your dad have a hearty appetite? The Smokies are a great place to sit down for a delicious meal. One of the most sought after foods in the mountains is Rainbow Trout. The iconic Smoky Mountain Trout House has been serving up good eats for decades and is easy to find on the strip in Gatlinburg. Trout can be fried crispy, baked with lemon or anyway you can imagine it. The HeySmokies trout eating team loves the trout almandine with a couple of slices of lemon on the side. No matter what your taste buds have a hankerin’ for you won’t leave hungry! Satisfy Dad’s sweet tooth in the Smokies. Sooner or later we all need a little sugar pick me up and the selection of sweet treats in the Smokies is sensational. Take a stroll down the strip in Gatlinburg to the Ole’ Smoky Candy Kitchen. The entire family will enjoy watching the vintage taffy stretching machine roll out sweet treats that have brought a smile to families faces for decades. 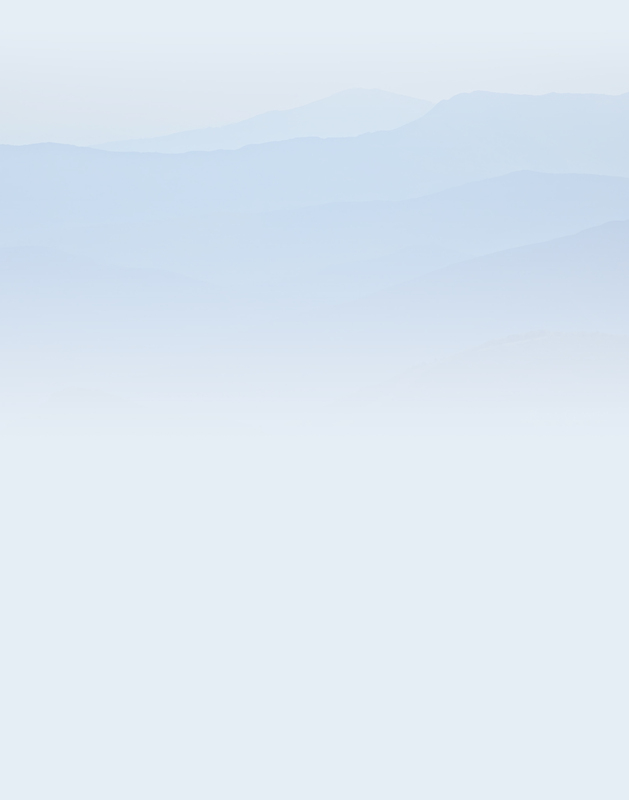 Saddle up for some Smoky Mountain trail riding! What better way to experience the Smokies than riding a trail with a personal guide. Jayell Ranch in Sevierville has miles of trails and the expert guides you need to have a safe and exciting equestrian experience. The view from the saddle is like no other in the mountains and those that give it a try, return to ride again and again. Take a hike! When it is time to stretch your legs the possibilities are limitless in the Smokies. With over 900 miles of trails you can choose from a walk in a lush hardwood cove forest in Greenbrier or a high elevation hike on the the famous Appalachian Trail. Many say that hiking is the perfect way to celebrate with dad. You never know what you will find when you step into the wild lands of the Smokies. It is not unusual to see bear, turkeys or maybe even an elk or two. Remember to take only photographs and leave only footprints. Bonus tip: After spending an awesome day in the Smokies, when the sun is setting low and you want to make sure your dad knows how important he is to you take a moment to give him a great big HeySmokies bear hug! They are free and possibly the best Fathers Day gift ever invented. Cast your line in the Smoky Mountains for the catch of a lifetime! Five Great Smoky Mountain Fishing Spots. Smoky Mountain Fishing is one of the most popular activities in Great Smoky Mountains National Park. The Smokies have over two thousand miles of streams and rivers within the park boundary. If you are ready for the challenge, fishing opportunities abound in the Smokies. Anglers from around the globe visit the park to test their skills in our pristine waters. If you are a novice or a seasoned pro you will be hollerin’ “Fish On” before you know it. Folks often ask HeySmokies, “What kind of fish do you have in the Smoky Mountains?” The five most common game fish in the Smokies are Brook Trout, Brown Trout, Rainbow Trout, Rock Bass, and Smallmouth Bass. Each of these beauties are a thrill to catch. The HeySmokies fly rod squad agrees that the most beautiful fish we ever caught is the one on the end of our line right now! The HeySmokies fly rod squad has trekked across the Smokies from end to end over the years and we know where the fish tend to be biting. For those who are unfamiliar with the park here are a few fishing destinations you will want to explore. If you are after Smallmouth bass and Rock bass a couple of good places to begin would be the Big Pigeon River on eastern edge of the park. The Pigeon is easily accessed in Hartford, TN via Interstate 40. The Waterville road I – 40 exit, five miles south of Hartford near Big Creek, is another spot with easy access. 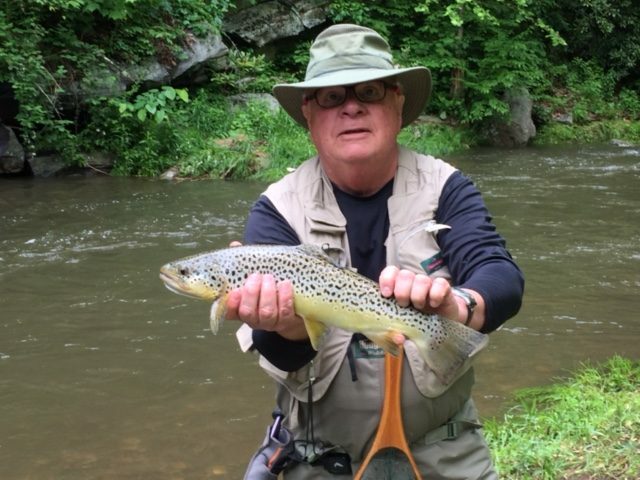 If you are after trout you can’t go wrong in Big Greenbrier five miles east of Gatlinburg. Porters Creek and the middle prong of the Little Pigeon river are popular spots in “Big G.” If you plan to visit the North Carolina side of Smokies make plans to cast a line in Cataloochee near Maggie Valley or Deep Creek near Bryson City. Both places offer solitude and a sense of immersion in the mountains. Brook Trout is the only species of trout native to the Smoky Mountains. This fish is known as “spec” or “speckled trout” by Smoky Mountain natives and is one of the most elusive and difficult to catch. Many anglers are not aware that spec is not a true trout but a “char.” The historic range of char stretches from Canada to north Georgia. “Brookies” in the Smokies usually have a life span of less than three years and rarely grow larger than 8 – 9 inches. 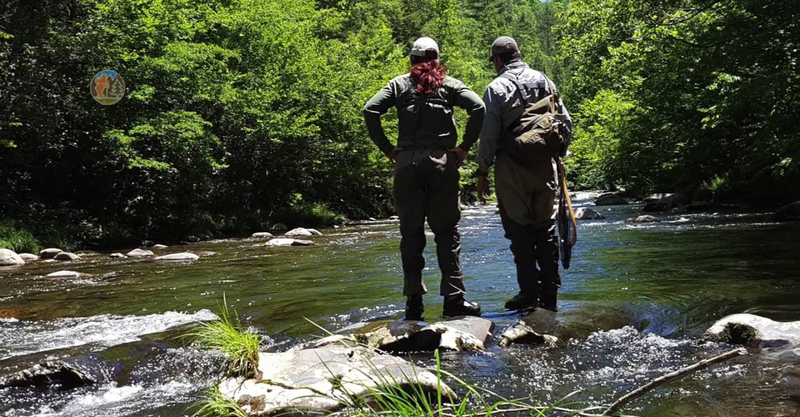 Deciding which stream to fish may be the most difficult thing about angling in the Smokies! lower elevation streams, they thrive in slow moving water with good cover and lot’s of hiding spots. “Brownies” were brought to the the United States from Europe and compete with other species in the Smokies. They are long lived and it is not uncommon for them to survive up to twelve years. The majority caught in the Smokies are six to twelve inches in length and have been known to become thirty inches long weighing eleven pounds. Can you imagine the feeling of reeling in one of those bad boys? Rainbow Trout are the most common game fish in the Smokies and are highly prized by anglers. Rainbows are found in almost every stream in the national park and are recognized by their familiar pink-toned stripe on their side. Like Brownies, Rainbows are not native to the Smokies, they were introduced from stock in the Northwestern United States. They were released into our mountain streams by logging companies in the early 1900’s. Most Rainbows reeled in by anglers are six to ten inches in length with an average age of three to five years. It is extremely rare to find rainbow trout over twelve inches in length. Smallmouth bass and rock bass inhabit the lowest elevation streams and rivers in the Smokies on the borders of the park. They prefer cool deeper pools and shaded areas near the banks of the river. These species are native to the Great Lakes region and the Mississippi river. Smallmouth bass are the largest of the two and are usually six to fourteen inches in length. Their lifespan is five to seven years and a five pounder is considered a trophy fish. Rockbass are smaller in size ranging from four to eight inches in length but occasionally reach up to ten inches. Their typical life span is six to eight years. Bonus angler tip: Did you know only one fishing license is required to fish Great Smoky Mountains National Park? With roughly half the park in North Carolina and the other in Tennessee a valid license from either state gives you total access to over 500,000 square miles of fishing heaven. As if you needed another reason to come fish with us!